Giorgio Chinaglia (January 24, 1947 – April 1, 2012) was an Italian footballer. He grew up and played his early football in Cardiff, Wales, and began his career with Swansea Town in 1964. He later returned to Italy to play for Massese, Internapoli and S.S. Lazio in 1969. He was the leagues top scorer and led Lazio to a victory in the Scudetto of 1974. He played international football for Italy, including two appearances at the 1974 FIFA World Cup. In 1976, Chinaglia left Lazio to sign with the New York Cosmos of the North American Soccer League. With the Cosmos team that also featured Pelé and Franz Beckenbauer, Chinaglia won four league titles, and retired in 1983 as NASL’s all-time leading scorer with 243 goals. Giorgio is still the only player to register more goals than games played. 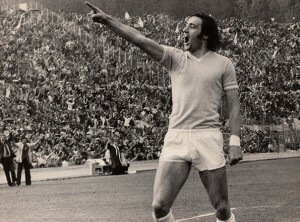 In 2000, Chinaglia was inducted into the United States National Soccer Hall of Fame and was named the greatest player in Lazio’s history during the club’s centenary celebrations.